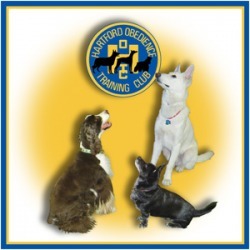 The Hartford Obedience Training Club, founded in 1937, is the oldest training club in continual existence in the country, training for Companion and Competition. It was founded as a branch of the Nutmeg Dog Club, and despite setbacks of the periodic loss of training quarters, it has remained in uninterrupted existence to this day. Located in West Hartford, Connecticut (CT) we are proud of our history. We welcome all dogs to join our training services, not just purebreds. Because we feel a dog is a lifetime commitment, our goal is to teach people to train their dogs to their highest skill in Obedience, making them better companions, creating a bond between owner and dog, to create an attitude of good sportsmanship and to abide by the creed of a dog - "Win Without Boasting - Lose Without Alibi." The training techniques used by our instructors employ AKC routines, if you desire, you may enter AKC matches and/or trials. AKC Obedience, Rally and Agility competitions will be open to all dogs including mixed breeds. The United Kennel Club also offers titles for both purebreds and mixed breeds at their shows which are held throughout the year.